Comparatively compact and light in weight, the 2350DL jumps the first hurdle of installation by being refreshingly easy to get out of the box and position on your desk. Once there it looks stylishly designed, well finished and built to a high standard throughout. Software set-up is equally painless, with simple but effective printer drivers. In keeping with its slightly smaller-than-average size, the paper input tray also has a lower-than-average volume at a 200-sheet capacity. If that's simply not enough, optional extras include a second input tray, adding a further 500-sheet capacity, as well as an automatic duplex unit. Inside the printer there's 64MB of memory that proved sufficient in our tests for producing full-page prints from high-resolution photo files. This was true not only from the host PC, but also from the direct printing PictBridge port, the 2530DL being one of a small number of laser printers on the market to feature this additional connectivity. On top of that, you get Ethernet built in as standard fare, making the Konica Minolta extremely well-connected at the price. Mono printing is quicker than a lot of the competition, with up to 20ppm output. First page mono prints are equally impressive (as little as 12 seconds), although things slow down to more average levels for colour and photo printing. You'd expect any printer with a PictBridge port to be pretty handy at photo printing. Even though Minolta pulled out of the camera business last year, its photographic heritage is evident in the 2530DL. The printer uses the company's Simitri polymerised toner that gave superb photographic results in our tests, even on standard plain paper and card. Photo prints had rich, vibrant, yet accurate colour, while there was plenty of detail retained in highlight and lowlight areas alike. Back on workaday printing tasks, mono text was crisp and colour graphics had bags of impact. 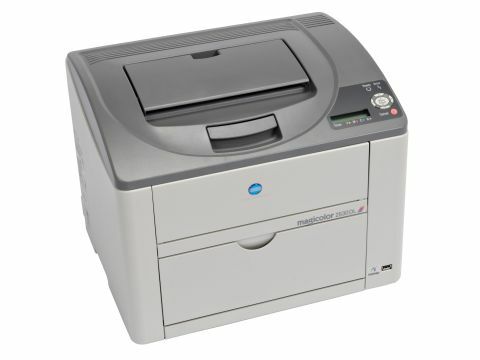 In contrast to its print quality, running costs can feel difficult to stomach with the 2530DL. In time-honoured tradition the printer ships with low-yield cartridges that only last for about 1,500 pages. After that, a full set of high-yield cartridges costs about £360 - practically twice the price of the printer itself. Furthermore, although the printer works out reasonably frugal in ongoing toner costs (if you do buy the high-yield cartridges option), the imaging unit only lasts for about 11,000 colour prints and costs a further £119 to replace. To put it another way, the imaging unit adds an extra penny onto the cost of every colour print. All things considered, the Konica Minolta 2530DL is still a very good buy. It's slightly sluggish for colour document printing, but quick for mono and great for photos. It's compactness makes it perfect for home and small office use and the printer itself is great value for money. Even the running costs can be reasonable once you get over the shock of your first set of high-yield toner cartridges.